Tough meets extra lightweight in these cotton duck weave shorts with more features than a Swiss Army Knife and the build quality to boot. With features the Legends range is renowned for, the breathable duck weave cotton is silicon washed for a soft feel that disguises its strength and tear-resistance. 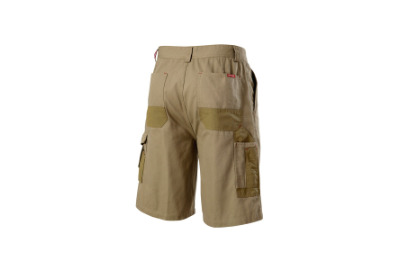 These legendary shorts feature triple stitching throughout and double-strength pre-shrunk Cordura® nylon patches in critical areas to ensure resilience to even the hardest wearing tradie. Functional as well as tough you have extra-wide belt loops and 13 pockets include phone, ruler and pencil pocket, flip-out gadget pocket on the waistband and a reinforced hip pocket lining meaning pliers, screw drivers or accessories won't tear straight through. These are the ultimate shorts for staying cool in hot, tough conditions.